I entitled this Threshold because it evokes such an ominous feeling of portentousness, of momentousness: as though once one steps through the doorway, over the threshold of the church courtyard, there will be no turning back. To a great degree, so it was, and so it remains. 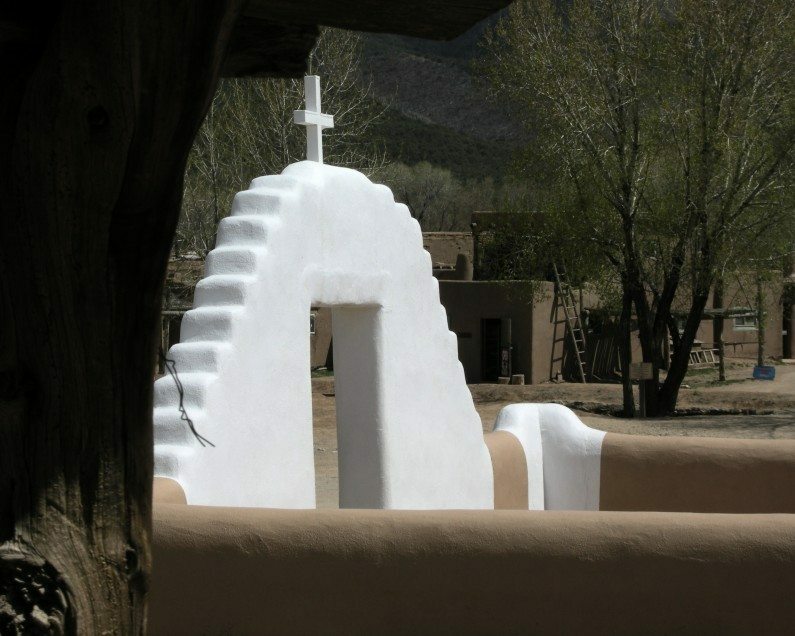 After 500 years, that cross is now a part of our lives, of our contemporary culture, of our Pueblo itself. But it was not always so, and some of us retain the ancestral memories of the day before the arrival of the cross and the sword, the day of our pure red earth. And so we choose not to cross that threshold, or to recross it in the other direction, out into the fresh air and budding trees and dusty earth and warm light of our essential selves. Posted on Sunday, June 15th, 2014 at 11:53 am. Filed under: Taos Pueblo: Ancestral Places, Sacred Spaces, The Photography	RSS 2.0 feed.